Reporting with Salesforce InfoCaptor's Salesforce connector simplifies export of data into MySQL database tables and then you can run beautiful visualizations and publish automated dashboards for your users and clients. Export multiple year data to perform timeseries and trending analysis. No need for additional BI or visualization tool. 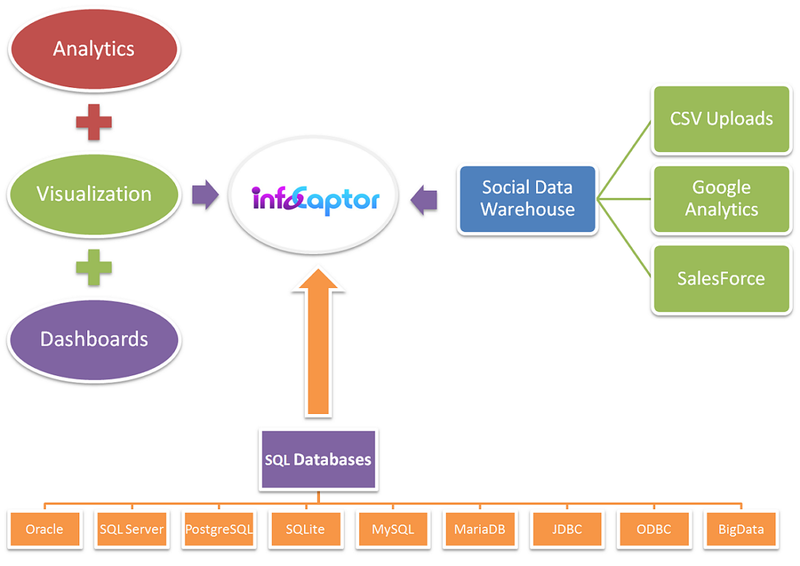 InfoCaptor becomes your one stop place for ETL - Visualizations and Dashboard publishing. You are no longer limited to the standard dashboards/reports. You can build and customize your own dashboards. Export huge amount of data from Salesforce and import into database. The import jobs automatically brings incremental data on a daily basis all while you sleep. Do you wish to have better reporting and dashboards? Your published reports and dashboards will remain fresh on a daily basis without you needing to touch anything. What if you could save hundreds of hours with all of your weekly and monthly reports and streamline all your client reporting?